Yikes! 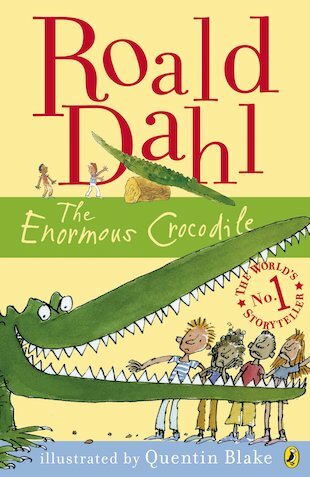 The Enormous Crocodile is the greediest creature in the whole jungle – and he’s determined to eat a nice juicy child for lunch! He’s a terrible boaster and very proud of his secret plans and clever tricks, like disguising himself as a seesaw and a picnic bench for careless little children to sit on. Crunch! Can the other jungle animals stop the cunning crocodile’s sneaky scheme and teach him a lesson he’ll never forget? This classic comic tale of snapping teeth and sharp wits is stuffed with Quentin Blake’s mouth-watering artwork! A great book. Loved it and quite funny….... Also liked the talking animals LOLLAUGH OUT LOUD. He he…............ I’ve never seen a crocodile in my life-well one! but the crocodile was not that big. Oh but it was a great book and it linked with THE TWITS. Roly- Poly bird and Muggle wump. I’ll love to read it again. If I could give a vote out of ten in my opinion it would be 9/10! That is great but I like bad endings, well good ending when he learns his/her lesson but something actually to happen to innocent children to feed the crocodile belly and he swallows his/her whole and they cut the crocodile in half and out pops the child who had been eaten or something like that.